The Companion to Little Dorrit provides the most extensive information yet available on the political, cultural, and personal backgrounds of a novel that today is considered a central text of Dickenss dark period, and a major work of nineteenth-century literature. The Companion emphasizes the importance of the Crimean War through both the complex political rhetorical surrounding the Circumlocution Office, and Dickenss depiction of Daniel Doyce, as well as through many other textual details. The Companion also makes important distinctions between administrative reform and civil service reform, and points to differences between boards of inquiry, committees and reports that conventional wisdom has frequently confused. Of special interest are the notes on the political figures of the dayLord Palmerston, Lord Aberdeen, Sir Charles Treveylan and Austen Henry Layard, among many othersand on the debates in the House of Commons that were reported by The Times and that eventually found expression in Little Dorrit. Drawing on parliamentary papers and other first-hand accounts, The Companion also paints a vivid picture of life in the Marshalsea prison, enhancing our understanding of insolvency law and the world of the debtor. The notes reveal not only that Dickens was both very knowledgeable about his subject, years after the incarceration of his own father, but also that he excluded the more salacious aspects of life in a debtors prison. Equally revealing are the notes on Dickenss family and friends, particularly on Maria Winter (née Beadnell) who wrote Dickens a few months before he began to write his novel, unleashing a tremendous amount of pent-up emotion and longing, and on such cultural figures as John Sadleir, the bankrupt suicide who was the model for Mr Merdle, and Thomas Griffiths Wainewright and Pierre-Francois Lacenaire, the notorious criminals who inspired Dickenss characterization of Rigaud, the gentlemanly villain of Little Dorrit. The Companion also uses a newly-discovered Dickens letter to shed light on Tattycoram, the girl from the Foundling Home employed by the Meagles. As well, The Companion draws on early nineteenth-century travel guides, travellers diaries, and, most extensively, on Dickenss own comments in Pictures from Italy to illuminate the Dorrits' Continental tour. An especially full appendix on foreign language and foreign speakers highlights Dickenss own knowledge of French and Italian, discusses his representation of French and Italian speech and provides a list of the devices that he uses to characterize foreign speech and foreign speakers of English. The Companion also provides detailed explanations of Dickenss many allusions to art, literature, and popular culture, along with a full-range of illustrations and maps to bring alive the world of the novel to the modern reader. Trey Philpotts is an Associate Professor of English at Arkansas Tech University. He has published in Dickens Studies Annual, Dickens Quarterly, and The Dickensian, and, since 1995, he has been the Review Editor for Dickens Quarterly. "Philpotts provides annotations to Little Dorrit on a scale hitherto unattempted. Especially helpful is the introduction, which explains that events that underlie the novel, particularly the national debate over the Crimean War. The 470 pages of annotations to specific passages identify allusions and clarify any matter that a modern reader might find obscure. For each of the original 20 serial parts, Philpotts includes a transcript of Dickenss outline plan. There are 33 illustrations, mainly of places used as settings in the novel and of people thought to have inspired the characters in the novel. The five appendixes include an analysis of the novels time line, an explanation of the novelist's original title, and a discussion of the devices used to signify foreign speech and speakers. This volume is packed with information concerning anything one might want to know about the novel; it is an indispensable tool for every serious student of Dickens.Summing Up: Essential. Lower-division undergraduates through researchers and faculty." Apart from their literary appeal, Dickens's novels have always exerted a powerful historical interest, with works such as Bleak House often being regarded, by scholars and enthusiasts alike, as windows on the nineteenth century. Dickens actively indulges this kind of interest, because he himself was always fascinated by contemporary issues, by the look of London, its changing surface, and by the myriad fleeting forms of material reality. Hence it seems entirely natural for Trey Philpotts to have spent 500 pages supplying historical annotations to Little Dorrit in this, the ninth volume of the Dickens companion series; such scholarly indulgence could well have appeared a little obsessive in relation to other writers, but in Dickens's case, it seems entirely appropriate. Extensive explanatory notes are especially rewarding with respect to Little Dorrit because of all Dickens's novels it is the one most deeply saturated in the social and political issues of the time. There is the historical background relating to debtors' prisons, which Philpotts explores in great detail, incorporating numerous extracts from government reports and prisoners' testimonies, as well as an 1819 ground plan of the Marshalsea. He also supplies a significant body of material relating to the Crimean War, financial speculation and government incompetence in the 1850s, material that sheds important new light on some of the novel's more polemical elements. Separating the strands that made up Dickens's satirical representation of the Circumlocution Office, Philpotts discriminates between the Chelsea Board and the Sebastopol Committee, between civil service reform and administrative reform, and between various committees and boards of inquiry that were distinct, though contemporaneous. He also shows how, after the end of the Crimean debacle, Dickens's emphasis changed, with his satire on the Barnacle clan shifting from war-related issues to free trade, harvests, bleaching-factory legislation and ministerial spin-doctoring. But most of this book has very little to do with the novel's main themes, being given over to divers little factual notes and anecdotes inspired by stray lines in Dickens's text. Many of these notes are very full, supplying a wealth of information on green tea, black tea, monocles, gout, barrel-organs, Billingsgate, Hackney coaches and slang. Such heavy annotation would have been impossible  and rather unendurable  in a reading edition, but here the length of the footnotes is a pure pleasure, with Philpott's spade regularly unearthing rich, peaty matter. Some of the more quixotic elements of this labour of love are helpfully offset by a very good index, which makes it relatively easy to revisit even the most apparently arcane of references, and by extensive cross-referencing to other works by Dickens and his contemporaries. With this in mind, it seems perfectly possible to imagine this book being extremely useful to all manner of Victorianists, quite independently of its connection with Little Dorrit. Little Dorrit is probably Dickenss most densely allusive 20-part novel. Explanatory annotation therefore presents a formidable challenge, in terms both of the research required and the tactical decisions to be made about how much actually needs annotating. In relation to the latter problem the Companion Series has risked erring on the side of excessive annotation. This is probably wise in the long run: as Dickenss world recedes from our own, more will need explaining to his readers in the next generation than may be thought necessary at present; and for readers, in England and abroad, who are less familiar anyway with English culture and history, over-supply is the better judgement. Trey Philpotts has been working on this project for many years. The present reviewer recalls welcoming his 1991 article, in The Dickensian, on The Real Marshalsea, when he revealed the prison layout and the details of Marshalsea life that Dickens chose not to include in either his autobiographical fragment or Little Dorrit. In fact, Dickenss recreation of the Marshalsea in the novel  i.e. what he chooses to detail  is shown in the Companion to be uncannily accurate. Philpotts remarks that the only case in the whole novel of a possible discrepancy between the real and fictional worlds (116) of the Marshalsea is when Arthur first visits the prison and follows Frederick Dorrit as he turned in at the third or fourth doorway on the right-hand side of the main residential block. The fourth doorway would actually have led to the accommodation reserved for female debtors only. It is a small point, but Philpottss observation on Dickenss extraordinary accuracy is impressive testimony to the extent to which the prison experiences of Dickenss childhood remained luridly precise in every detail to the novelist over thirty years later. This meticulous checking of Dickenss accuracy raises a larger issue. 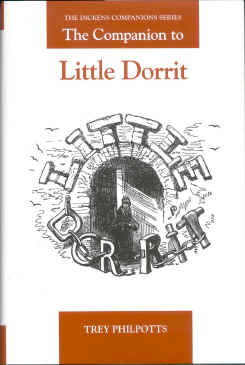 Because Little Dorrit draws so much on the known, material, historical world of the 1850s and 1820s, the Companion annotator  unlike, say, his Penguin or Norton editorial counterpart  finds himself in the position again and again of not only explaining topical and topographical references but enlarging on the details of the actual historical material to the point where Dickenss fictional working of such material can even seem to be put under some positivist pressures. Where, how and why does Dickens deviate from the historical records? Should we be chiding him for his anachronisms, remembering that Little Dorrit was supposedly set in the 1820s? Dickens might have set Dorrits prison accommodation in the wrong part of the block. So what? In what ways is that important? What reader was ever to know that except someone who has spent a long time researching early nineteenth-century Marshalsea history? Well, the Companion now makes sure hundreds of readers of Little Dorrit will know that odd slip, just as they will also now know the full extent of Dickenss debts to and deviations from all those recorded historical facts that prompted so much in his novel. This may sound ungrateful to the exacting quasi-archaeological work undertaken by the recent Companion compilers, but it is not so intended. The Companions are now a substantial presence in the Dickens studies industry, not just a modest service sector. This must prompt questions about their status and function in so far as these impinge on our reading of the fiction. Their painstaking patchwork reconstitution of the historical matrix inflects the experience of their novels in elusive ways. According to the Series Editors, the nature of the annotation is factual rather than critical (xi); but at certain points the distinction is smudged. For example, Philpotts annotates a moment when Tattycoram and Miss Wade are seen together: Close companionship between women was common throughout the nineteenth century ... [they] would engage in kisses, sleep in the same bed ... without anything being thought amiss.... That such behaviour might be considered lesbian, as modern readers are inclined to think ... seems unlikely (301). That account may be factual but here it also becomes a critical intervention. This particular volume is one of the largest in the series. Its subject is, of course, colossal. There is, for example, the range simply of biblical allusions, whether specific and intentionally allusive or just chance echoes and cadences that have found their way into Dickenss prose. Drawing attention to their frequency here prompts one to think this must be Dickenss most religious novel, not least in its passionate anti-religiosity. The biblical phrases and cadences, deliberate and accidental, remind us too of the rich cultural compost of Dickenss language, and for that we should be grateful to the Companion. On the political elements in the novel, Philpotts is convincing in associating the Circumlocution Office with the Treasury, rather than the usual suggestion that it is modelled on the Civil Service. He adduces plenty of evidence to back this identification, on several occasions. Elsewhere some of the more arcane annotation is eye-catching: for instance there is a whole paragraph on contemporary wage-levels and employment conditions of metropolitan plasterers to accompany Mrs Plornishs complaint about jobs seeming to have gone underground (173). We stray to the borders of daftly supererogatory annotation when Mr Fs Aunts announcement that Theres mile-stones on the Dover road? is accompanied by a solemn explanation that, under an Act of 1774, all main and important secondary roads were measured and milestones erected ... (271). By and large, however, the provision of information is both generous and well-judged. On this long journey through the novel, Philpotts is not too garrulous a companion, though massively well-informed. In fact, despite the queries and reservations recorded above, this is a really splendid volume. It makes absorbing reading from cover to cover, and illuminates its subject in dozens of different ways. I had always assumed, idly, that when Mrs General, in Venice, cites Mr Eustaces guidebook as comparing the Rialto, greatly to its disadvantage, with Westminster and Blackfriars Bridges, she was giving her own fatuously chauvinistic reading. But here indeed, in the Companion, we have Mr Eustaces own words: The celebrated Rialto ... sinks almost into insignificance when compared with..the superb ... structures of Blackfriars and Westminster (370). The volume aims for comprehensiveness within manageable limits. There will continue to be discoveries that will increase or further nuance our sense of the context of Little Dorrit. This journal has a few more to offer: for instance, Gilian Wests suggestion of an original for Mrs Clennams house (Winter 2000) and Dr Cosnetts diagnosis of the nature of Mrs Clennams paralysis and Flintwinchs focal dystonia (Spring 2003). Might one also suggest another candidate model for RigaudBlandois (alongside Philpottss Wainewright and Lacanaire)? In Dickenss essay A Flight, there is a sinister Frenchman, showily dressed, saturnine, with a hook nose, got up, one thinks, like Lucifer or Mephistopheles ... transformed into a highly genteel Parisian. Malcolm Y. Andrews, The Dickensian, Summer 2003, pp. 16971. Cet ouvrage est le neuvième titre dans la série coordonnée par Susan Shatto et David Paroissien commencée en 1986. Il fournit une aide inestimable au lecteur de Little Dorrit, un des romans noirs de Dickens, en rassemblant des informations très riches sur le contexte historique complexe et souvent impénétrable : la guerre de Crimée, le « Circumlocution Office », les grands figures de lÉtat tels Lord Palmerston ou Lord Aberdeen, ainsi que les débats de la Chambre des Communes qui viennent enrichir le texte de Dickens. Trey Philpotts offre une étude du fonctionnement de la prison de Marshalsea et des lois sur la faillite au milieu du dix-neuvième siècle en Grande-Bretagne, ouvrant ainsi des pistes pour une compréhension plus profonde des enjeux non seulement politiques, mais narratifs et linguistiques de ce texte. Les trente-trois illustrations comprenant cartes, gravures, croquis et peintures forment un support iconographique de lépoque victorienne (incluant également des peintures dautres époques chères aux Victoriens) qui aide le lecteur à entrer pleinement dans les réseaux de références culturelles qui restent souvent opaques. Le tableau Caritas Romana, peint en 1670 par Lorenzo Pasinelli, sert de support à Philpotts pour élucider les références à cette scène contenues dans luvre de Dickens. Little Dorrit sacrifie sa vie à son père « a fountain of love and fidelity that never ran dry or waned », un écho de Childe Harolds Pilgrimage de Byron. Lauteur énumère les nombreux tableaux et gravures traitant de cette scène ainsi que les pièces de théâtre ou les romans de lépoque tel North and South de Elizabeth Gaskell. Si la culture classique est soigneusement documentée, la culture populaire nen est pas pour autant négligée : les références à la publicité, aux voyages, à la santé sont parmi les sujets abordés dans ce « companion ». Ce travail minutieux nest nullement pédant et le texte de Philpotts reste vivant tout en se lisant agréablement et il ne peut être quun outil précieux aussi bien pour les enseignants, que les étudiants et les chercheurs. Recension de Sara Thornton, Maître de Conférences, Université de Paris VII.